Virtualization has transformed enterprise IT by generating more business value from datacenter servers than ever before—accomplishing more with less. Virtualization optimizes IT by unchaining IT services from specific hardware, redelivering them in a flexible, virtual form which maximizes the return on IT investment. Please join Ars Technica, Intel and IBM to learn more around consolidating virtualized applications on one scalable system and scaling your infrastruture as your business grows. Learn how to maximize your Business Value with Virtualization. The third in a series on Virtualization, this conversation covers further benefits of virtualization which are realized after the server room or data center footprint has been consolidated. Please join Intel, IBM and Hot Hardware for this webcast. 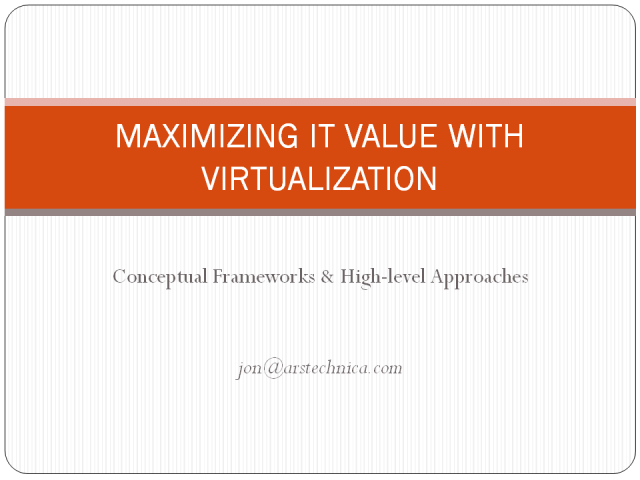 Part of a series on Virtualization, this webcast covers the economic value of virtualization. Please join DailyTech, Intel and IBM to learn about taking the next step with virtualizing enterprise environments. Virtualization has transformed enterprise IT by generating more business value from datacenter servers than ever before—accomplishing more with less. Virtualization optimizes IT by unchaining IT services from specific hardware, redelivering them in a flexible, virtual form which maximizes the return on IT investment. In this channel, you will learn more around consolidating virtualized applications on one scalable system and scaling your infrastruture as your business grows. Learn how to maximize your Business Value with Virtualization.